Plastic surgery procedure: Reshape nose by removing hump, changing shape of bridge or tip , narrowing span of nostrils, or changing angle between nose and bridge upper lip. Side Effects: Swelling, bruising around eyes, nose. Plastic surgery procedure:Correct puffy bags below and drooping upper eyelids the eyes by removing excess fat, skin, and muscle. Side Effects: Tightness of lids, swelling and bruising. Temporary dryness. Recovery: 7 to 10 days. Enhance body shape by removing fat deposits with a tube and vacuum device. Common areas for smartlipo -liposuction include, cheeks, chin neck, abdomen upper arms, above breasts, hips, thighs, buttocks. Outpatient Extensive procedures may require inpatient stay. Side Effects: Bruising, swelling, soreness, burning sensation, numbness. Plastic surgery procedure: Enhancing sagging facial skin, jowls, and loose neck skin by removing excess fat, tightening muscles, redraping skin. Inpatient: Stay one day in the hospital. Side Effects: Bruising, swelling, numbness and tenderness of skin; tight feeling. Procedure Set prominent ears back closer to the head(Occasionally covered by insurance). Side Effects: Bruising, swelling, numbness. 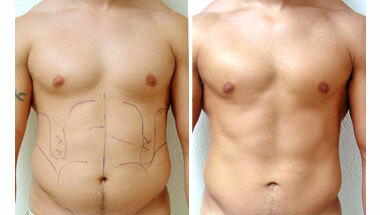 Procedur Reduce enlarged, breast in men using liposuction or cutting out excess tissue under skin. Length: 1 or 2 hours. Anesthesia:General or local with sedation.